IT Cosmetics is a cosmetic brand developed with plastic surgeons - sounds promising. The co-founder and CEO, Jamie, is looking for solutions to 'real' problems. Honestly, I like this girl - if you see her before and after pics, she has serious redness (I can relate). She's putting herself out there, showing off her skin issues and giving us a solution. This brand was purchased by L'Oréal - The major makeup empire boost has proven to be successful. It Cosmetics is getting great reviews and many of IT Cosmetics products are on Sephora's 'best sellers' list. I had to give this stuff a try.. I call this my 'anti-redness warpaint'. If you have Rosacea or hyper pigmentation, this stuff is going to change your life. I desperately needed a solution to my rosy cheeks and forehead. Although I use medicated creams, my angry skin flares up on the daily. I suppose I could stop eating spicy food and drinking wine - NAH! In comes Bye Bye Redness by IT Cosmetics.. It's kind of a foundation, primer and cream in one. 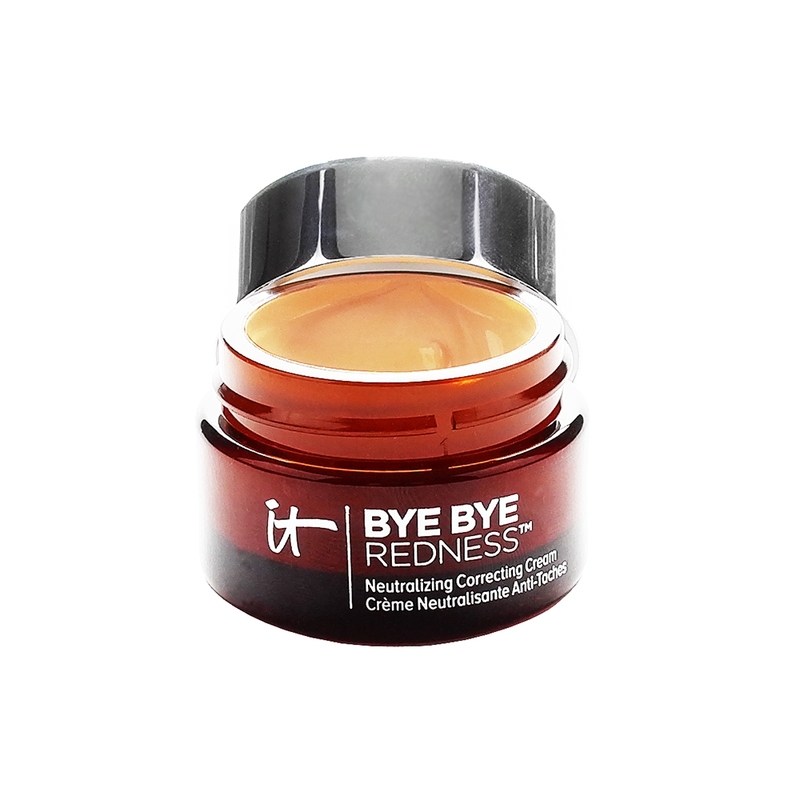 Bye Bye Redness is thick, has a silky texture and gives you super full-coverage. This product is smooth, goes on like a primer (similar to Colorscience primers), and has a tinge of green (to combat redness). Apply to your cheeks, nose and forehead, and blend outwards. A little goes a long way. The embarrassing redness is gone. GONE! Without a doubt, this is the product find of 2017! I love Bye Bye Redness, so I thought I'd try a few more products from the IT Cosmetics lineup.. 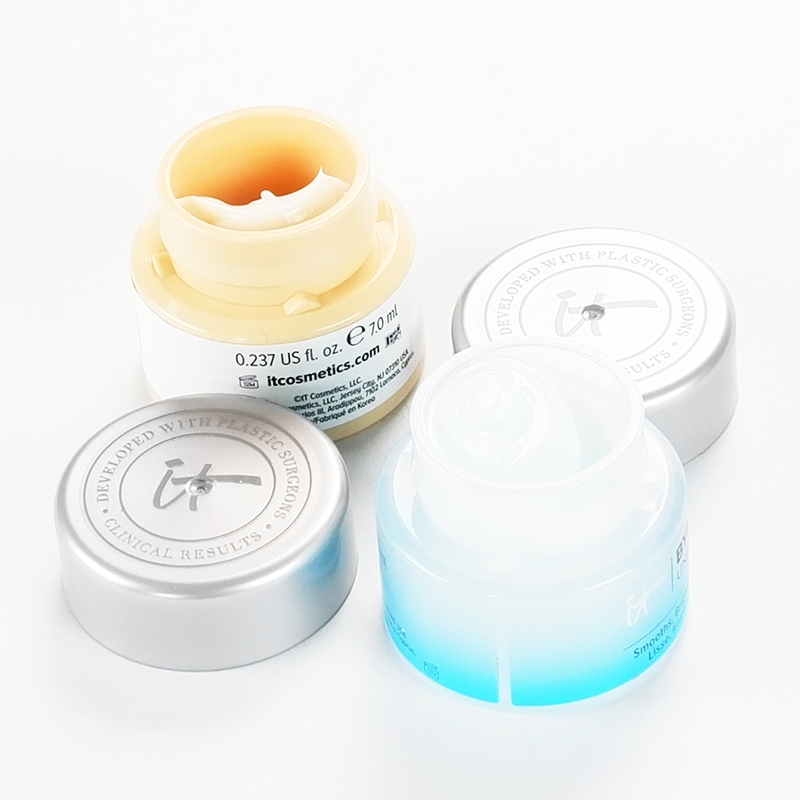 The Confidence in a Cream (the pale yellow pot) is a 'transforming moisturizer in a cream'. The texture is nice, just thick enough and leaves your skin feeling moisturized. It does however take time to absorb (not ideal when applying makeup). I liked the feeling of my skin after applying this cream, but the scent is a bit of a turnoff. I'm sorry Jamie, but this stuff smells like hotel cream. If scent is not an issue for you, I'd say this cream is great for colder seasons. It's super moisturizing. 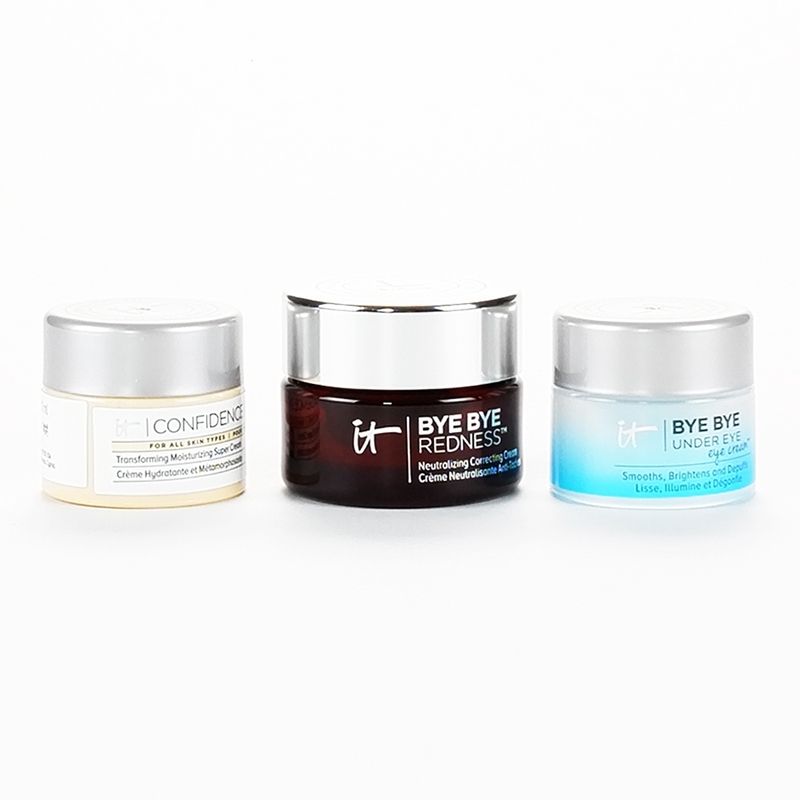 I didn't like the Bye Bye Under Eye eye cream (the blue pot). It made my under eyes feel super tight and people said I looked tired. Whether or not this eye cream tightens, brightens and depuffs - I'm not sure, cause I only used it for a week. I guess my go-to Neo Cutis eye cream still reigns supreme. I received a trail-size Super Hero Elastic Stretch Volumizing Mascara (I'm not one to cheat), but thought I'd give it a go. This mascara is great, lengthens your lashes, glides on nicely and no clumping. The oversized, tapered brush makes application easy and coats your lashes evenly. Albeit, my go-to Buxom mascara remains my favorite. 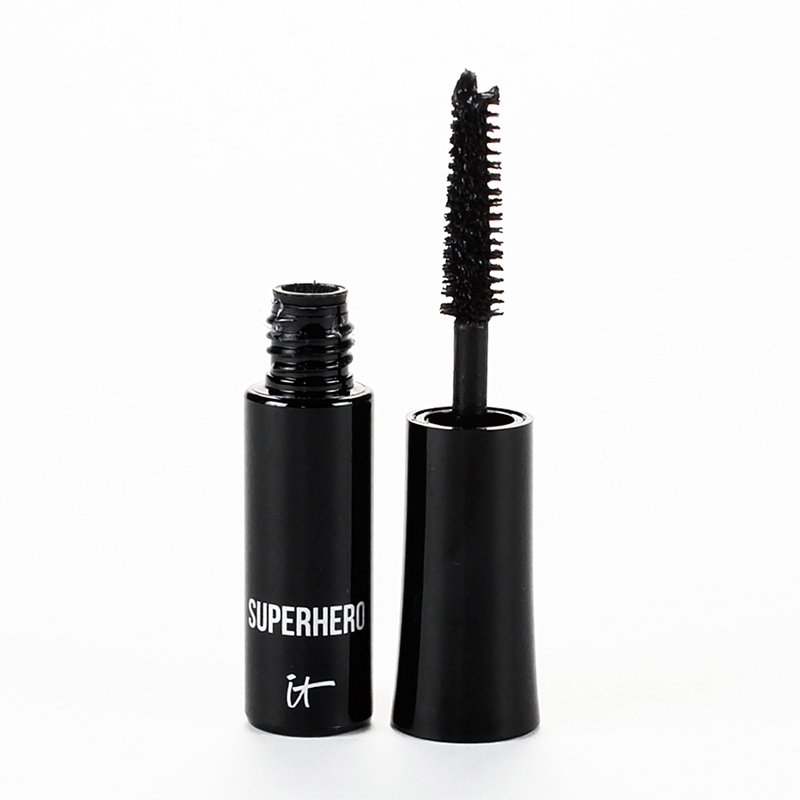 It's gonna take a true 'super mascara' to turn me. I intend to try more of the products from It Cosmetics. I'll let ya know my thought..